Budapest’s Hadtorteneti Museum chronicles nearly two centuries of Hungary’s military heritage. The Hungarian capital of Budapest is more than just a city. It is actually three cities in one, each with just a bit of unique color and flare. With 1.7 million inhabitants, the Hungarian capital today is made up of the old cities of Buda and Pest. Overlooking this modern metropolis is Buda Castle, the historic castle and palace complex located on Castle Hill on the Buda side of the Danube River. This World Heritage Site is also much more than just the palace. Buda Castle encompasses much of the hill and is a city within a city. While the castle walls date to the 13th century, Budapest was the site of many sieges and battles, the most recent being the 1956 uprising against Soviet rule. Castle Hill and the palace were heavily damaged during the Battle of Budapest at the end of World War II. Renovated after the war, it faced a different kind of destruction when the palace complex was almost completely gutted during the 1950s. Many important exterior details around the complex, such as the Habsburg Steps and the Royal Stables, were destroyed. The grandeur of the Habsburg era, however, remains throughout the city, and the Hadtorteneti Museum, which is situated in the northwestern part of the Buda Castle district, is where the military history of the modern Hungarian people can best be understood. “This was the original army barracks, which were built in the 1830s,” Mate Balogh, educator at the Hadtorteneti Museum, told Military Heritage. Within the large Habsburg-era complex is a collection that chronicles the history of Hungary’s struggle for independence during in 1848 and its aftermath, and through the transition as part of the Dual Monarchy, which existed from 1867 to 1918. The museum covers Hungary’s role as part of the Austro-Hungarian Empire’s Army during World War I, and covers offers detailed history on the military of the first truly independent Magyar nation, which was the Republic of Hungary. As a barracks, the building was part of the history it chronicles. During the 1848-1849 Hungarian Revolution, the Austrians, under the command of Alfred I, Prince of Windisch-Grätz, took Pest, the capital of the Hungarian Kingdom, while the Hungarian forces held Buda, then known as Ofen in German. Hungarian forces were able to force the Austrian army to retreat from Buda and drove them back toward Vienna. While Buda held out, the barracks were partially damaged and, according to sources, cannonballs still remain within the walls from the 1849 siege of the city. With Russian help, the Hungarian uprising was crushed and Hungary remained a part of the Austrian Empire. The Dual Monarchy was established in 1867 and existed until it came crashing down at the conclusion of World War I. With the end of the Dual Monarchy and Habsburg rule at the end of World War I, Hungary suddenly became an independent nation for the first time in centuries. The Hadtorteneti Museum was founded in the early 1920s as the first military museum of the new nation. Budapest suffered greatly at the end of World War II when the Soviet Army invaded Hungary. The original building was heavily damaged and much of the original collection was lost. A spiked helmet worn by a Russian soldier during the 1848 rebellion. Given the scope of the collection, which now chronicles the history from the 1848 revolution to the modern day, the museum has made a commendable effort. “We are impressed today with the efforts to rebuild the collection,” said Balogh. The building is flanked by a number of bronze cannons, which are among the objects that predate the revolution. The building includes a recreated stained glass window that depicts Buda as it looked in 1493. While the history of Hungary goes back centuries, due to size and to focus the scope of the collection, the Hadtorteneti Museum begins fittingly with a large gallery that includes numerous artifacts from the 1848 revolution, but the objects are not limited just to the uprising forces. This first gallery chronicles the uprising, which was just one of many such revolutions in 1848—a year that also saw major uprisings in Paris and Berlin. By viewing these collections, the visitor can better understand the complexity of the Kingdom of Hungary, which was very much a nation within a nation. Hungarian citizens, for example, had their own passports and thus were not exactly citizens of the Austrian Empire. The collection includes many Hungarian military uniforms, cavalry helmets, and other accoutrements that suggest that it very much had its own identity within the greater empire. 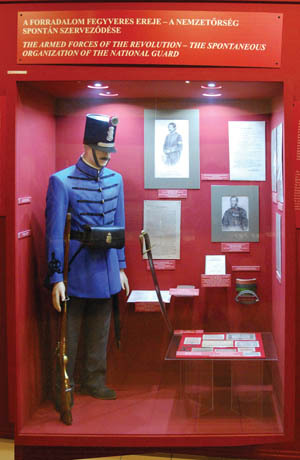 An exhibit depicts the dress of a Hungarian National Guard soldier during the 1848 revolution. With Russian aid through the 1815 Holy Alliance to restrain European republicanism, the Hungarian uprising was crushed and the country remained part of the Austrian Empire. “With the revolution the uniforms changed little with the Hungarian forces, except the cockades changed from the Austrian red and white to the Hungarian red, white, and green,” said Balogh. Given that much of the original collection was lost, the sheer volume of artifacts from this early Hungarian struggle for independence is impressive, and is represented by numerous small arms and equipment. The international diversity of the struggle, not to mention of the Austrian Empire, is also apparent in the unique uniforms that utilize nationalist elements for the respective troops. This includes artifacts such as a “sapkaja” cap of the Southern Slav irregular border scouts and Hungarian-style Hussar coats. “At the time the Austrian Army had many ethnic units and the uniforms tended to include many of these national characteristics,” said Balogh. One item of particular interest is an Imperial Russian guardsman uniform, complete with an early spiked helmet, which could place this as one of the first conflicts in which the headgear that was later associated with Prussia and Germany was used in combat. 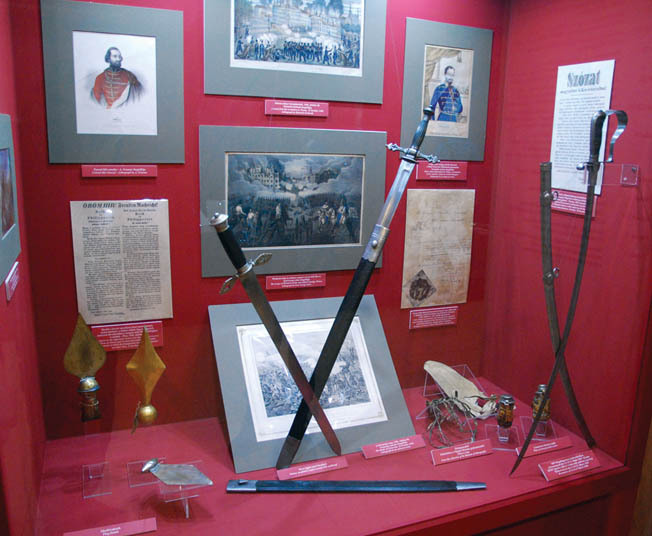 The Hadtorteneti Museum collection includes a sword that belonged to Hungarian General Janos Damjanich, who is considered a national hero of the Hungarian people. While he never lost on the battlefield and claimed he would defend the fortress of Arad to the last drop of his blood, he followed orders and surrendered to Russian General Dmitry Duturlin, and was executed in October 1849. 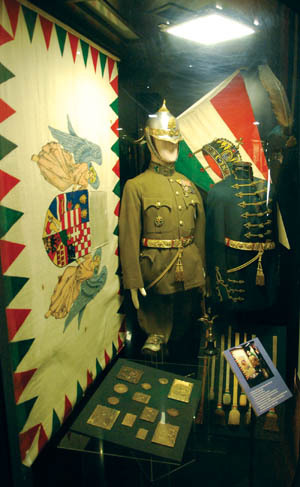 A display features Hungarian Guard uniforms from the 1920s. His sword now hangs below a painting that chronicles his role as a true battlefield commander. It remains a centerpiece of the museum’s collection. Following the failed revolution of 1848, many of the Hungarian leaders who were not captured or killed went into exile and found a place on other battlefields. Following the Austrian defeat during the Austro-Prussian War of 1866, cooperation between Austrians and Hungarians was all the more necessary. It was determined that the Habsburg Empire could only maintain its position as a great power with Hungarian contribution. Thus, with the establishment of the Dual Monarchy, the Austrian Emperor Franz Josef I became the King of Hungary and the army had a very different character. These included the official languages of Czechoslovakia, Poland, Ukraine, Romania, Croatia, and Italy, as well as the unofficial languages, including Serbian, Slovak, Slovene, Bosnian, Rusyn, and Yiddish. The museum collection contains numerous pieces from this era, where apart from Austria’s brief role in the Boxer Rebellion of 1900, the country faced crises but little in the way of actual conflict. Instead it was a regal time, the era of much pomp and circumstance, and the Hadtorteneti Museum offers many fine examples of uniforms, which proved anything but appropriate for the coming conflict. A display features swords and other weapons that were used by Hungarian nationalists during the revolution. Throughout 2013 the museum was in the process of updating its World War I collection in anticipation of the conflict’s 100th anniversary. Among the artifacts of note is a rare M1907 8mm Roth-Krnka self-loading pistol, a handgun that would not prove as successful as the American Colt 1911 .45 or the German Luger, but one it is one that is certainly iconic to Hungary. The collection also includes a rare example of the M1908 Pike Grey Field Uniform of the Austro-Hungarian Army, which proved unsuitable for the horrors of World War I, as well the updated M1915 Field Gray Uniform that was used throughout the remainder of the war. The museum also has a small collection of naval artifacts, which can help the visitor understand how the landlocked nation had Admiral Miklos Horthy as a leader. 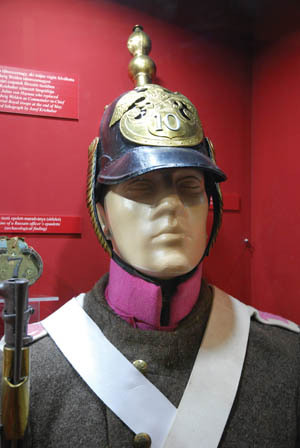 The collection also includes numerous artifacts of the post-World War I Royal Hungarian Defence Forces, including an M1924 Officer’s Parade Dress Helmet, which was influenced by the grandeur of the 1896 millennium celebrations and evoked the Zischagge helmets of the Middle Ages. There are also various examples of the interwar dress uniforms, which feature the traditional cords that were often used with Hussar jackets, which is fitting since this particular style of dress originated in Hungary. The 1926-pattern coat thus was known as the “Atilla Coat,” named after Attila the Hun. The irony of the Royal Hungarian Defense Force, of course, is that the Kingdom of Hungary had no king. At the end of World War I, under the Treaty of Trianon, the nation ceded lands to Czechoslovakia, Romania, Austria, and Yugoslavia, which meant the nation lost two-thirds of its territory and one-third of its native Hungarian speakers. In March 1919, Communist Bela Kun looked to seize power in Budapest, founding the Hungarian Soviet Republic. This led to a brief but devastating war in which French-supported Romanian forces entered Budapest and remained until early 1920. During this dark time, Red and White forces battled one another and the people of Hungary suffered greatly. In early 1920 Miklos Horthy was elected regent by the National Assembly, a position he held until October 1944. The museum’s collection includes a variety of other artifacts, including flags and banners and uniforms from the Red and White forces. With the rise of Nazi Germany to the west and the Soviet Union to the east, the Kingdom of Hungary found itself in a difficult position. “It is very true that Hungary was an Axis power in World War II and an ally of Germany, but it was a difficult position at the time,” said Balogh. Like the German Army, the Hungarian Army was limited in size by the Western powers and took measures to secretly rearm. This is apparent in the collection of the Hadtorteneti Museum, which includes numerous pieces devoted to Boy Scout units and other paramilitary organizations that allowed the nation to circumvent the restrictions placed on it. In addition, the current collection includes a number of notable weapons, including a Kiraly-geppisztoly submachine gun, one of the least encountered small arms of World War II. Other pieces include uniforms not only from the Hungarian military forces, but also those of Poland, Czechoslovakia, Romania, the Soviet Union, and Germany. The World War II collection is impressive and further features such notable items as an actual German Schwimmwagen, the amphibious four-wheel drive vehicle that was used extensively on the Eastern Front. 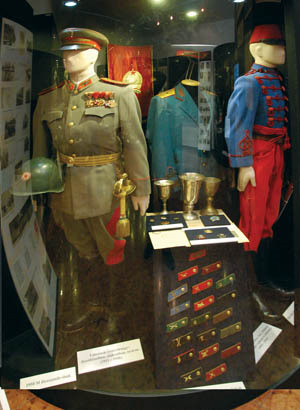 The post-World War II exhibit houses numerous Warsaw Pact items, including uniforms of the Hungarian Army during the Cold War. A number of Soviet items, including various medals issued to soldiers of the Red Army, are also in the collection. Equally controversial are the uniforms of Hungary’s Arrow Cross Party, which was led by Ferenc Szalasi from October 1944 to March 1945. At the end of World War II, Hungary was no longer a kingdom, and many had expected that the Soviet occupation would be short lived. The Hadtorteneti Museum chronicles the transformation of the Royal Hungarian Army to the Hungarian Democratic Army, which was charged with keeping peace in the postwar era. The Royal army had a British look and cut, but with the transformation to communism, it took on a Soviet-style appearance. “The Hungarian Army was quickly converted according to the Warsaw Pact, and many of the Democratic Army’s officers and NCOs were used to train the new People’s Republic Army, only to then be sent off to prison,” said Balogh. The museum also contains a section covering the 1956 uprising. This includes displays that recreate the look of the freedom fighters, the weapons they used, and the cost of rising up against the Soviets. The post-World War II collection still includes numerous Warsaw Pact items as well as Soviet small arms, such as the infamous AK-47, which is notable because the first time the assault weapon was widely seen by Western reporters was during the 1956 uprising. The museum also includes a section devoted to aircraft. While the museum is unable to house a full-size aircraft, it does display various aviation equipment and even the cockpit of a MiG fighter. The museum also has the charred wreckage of a German Bf-109 fighter aircraft in its collection. The Hadtorteneti Museum strives to make a number of exhibits as user friendly as possible, making available artifacts that visitors can hold and touch. With so many artifacts on display—from bronze cannons to helmets to an impressive amount of military firepower, as well as many fine military-themed paintings to propaganda posters—the Hadtorteneti Museum has a wealth of treasures. Tags American, Attila the Hun, Austria, Austro-Hungarian Empire, Austro-Prussian War, Axis, battlefield, Berlin, Bosnia, Boxer Rebellion, British, cannon, cavalry, CIA, Cold War, Czechoslovakia, Eastern Front, Europe, Features, French, general, German, Germany, Habsburg Empire, Hungarian Army, Hungary, Italy, machine gun, Magyar, military, Military Heritage, military history, museum, national guard, Nationalists, Nazi, Nazi Germany, OSS, Ottoman Empire, pagan, Paramilitary, Paris, pike, Pola, Poland, POW, propaganda posters, Prussia, Red Army, Roman, Romania, Russia, Schwimmwagen, Soviet Army, Soviet Union, submachine gun, sword, swords, Tern, The Eastern Front, the military history, Third Reich, Tory, Troy, Ukraine, Union, United States, Vienna, Warsaw, Warsaw Pact, weapons, WIN, World War I, Yugoslavia.